I decided to sign up for the Blast the Fat Transformation Challenge because over the past year I had some personal challenges. As a result I had gained unwanted weight. At my last visit to the doctor it was recommended that I lose a few pounds. I also was feeling the stress of the extra pounds in my workouts. I needed to do something! I needed control back in my eating! I needed to get back to smart eating. At first, after seeing the plan, I thought “No way!” It was such a drastic change but at that point I needed a drastic change. I found that this was a very simple and easy to follow change. I actually adjusted quickly to the meal plan. I enjoyed the simplicity of the preparation. I have incorporated items from this Challenge into my meal planning going forward. 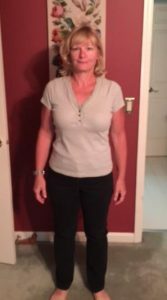 I lost the weight I needed and wanted to lose – 11 lbs. and 6.5” in just 6 weeks. What’s not to like?!! I feel great in my workouts. I am looking forward to seeing the doctor and getting improved lab results. And it’s nice that others are noticing the change. I would tell you if you are considering signing up for Sharon’s next Challenge to just be prepared for the change in what you eat in order to get where you want. Insure you have the support of your family. If you commit to the challenge, you will not be disappointed on the return. I also want to add that this is only the beginning. In order to maintain the success of the Challenge, you have to consider the long term change you have to commit to. I am taking each day at a time and am working hard to manage the triggers that sabotage my goals.